Dr. Dan Schrider is expanding his laboratory to study the demographic forces shaping human genetic variation and using deep neural networks to elucidate the genealogical information among individuals and species. As an undergraduate, Dan studied Computer Science at Indiana University. During this time he became interested in genomics and bioinformatics. For his PhD, he joined the lab of Matt Hahn (also at Indiana University), majoring in both Bioinformatics and Ecology, Evolution, and Behavior. His PhD work focused on elucidating the evolutionary forces acting on genomic copy number variants—large regions of the genome that are found in different multiplicities across individuals as a result of duplication or deletion events. In particular, Dan’s graduate work revealed a previously underappreciated source of gene copy number variants–a process called retrotransposition–and characterized the genomic landscape of these variants in humans and Drosophila. His graduate studies also quantified the spontaneous rates of new duplications and deletions in Drosophila, and their contribution to local adaptation. For his postdoc, Dan worked with Andy Kern at Rutgers University where he studied the population genetics of adaptation and worked to uncover the impact of natural selection on patterns of diversity in human populations. This included the development of a supervised machine learning approach using population genetic data to detect genomic regions constrained by purifying selection, which Dan in turn used to identify regions that had recently gained or loss selective constraint along the human lineage (i.e., human-specific gain or loss of function). 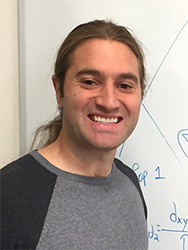 Dan’s postdoctoral work also sought to better characterize the impact of positive selection (i.e., adaptation) on multiple dimensions of genetic variation, and to use these multidimensional signatures to identify those regions in the human genome underlying recent adaptations with greater sensitivity and specificity than previously possible. Dan’s work at UNC currently focuses on the development of machine learning approaches for population genetic analysis. Importantly, this work has revealed that deep neural networks have the ability to make inferences about the evolutionary forces shaping patterns of genetic variation within a genomic region by directly examining the entirety of the sequence data from a population sample, while most methods rely on the measurement of one or more statistics designed to summarize the sequence data but that necessarily result in the loss of potentially valuable information present in the input data. During his short time at UNC, two postdocs have already joined Dan’s lab to study the demographic forces shaping human genetic variation, and using deep neural networks to elucidate the genealogical information among individuals and species. Dan is also interested in adapting his approaches for detecting positive selection to identify cancer driver mutations. More broadly, Dan is excited by the revolutionary potential of modern machine learning techniques when applied to problems in genetics, and hopes to continue to help drive the field forward on this front.